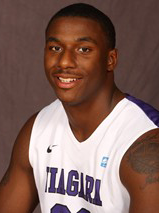 The future of Niagara forward Dominique Reid remains uncertain in days after his felony charges were revealed. An athletic spokesman said Friday that Reid’s status should be considered the same as Wednesday, when athletic director Simon Gray in a statement that Reid “is currently not participating in team activities.” The spokesman said he did not know if it is possible for Reid to rejoin the team at a later date. Niagara’s student records office said Friday morning that Reid is still enrolled at the university. His name remains on the team roster. Reid is reportedly facing two felony charges of fourth-degree grand larceny from incidents in December and April, and has a felony charge of second-degree identity theft added to the April incident. He also picked up a misdemeanor charge of second-degree aggravated unlicensed operation of a motor vehicle in October. Reid did not miss any game time as result of the mid-season arrest. He played in all 30 games last season and appeared in the first half of every game. The school confirmed Friday that Reid was not put under any other type of non-game related suspension during the season. Reid was Niagara’s third-leading scorer at 9.8 points per game and earned promotion to the starting lineup in the final 13 games of the season. He was named to the conference’s all-rookie team. Niagara has not had tolerance for legal missteps in the past. Basketball coach Chris Casey parted ways with forward Aaron Bodie after a shoplifting incident in January 2014. Niagara’s hockey team was prompt to suspend a former leading scorer for half a season after a DWI in October 2013. Hockey coach Dave Burkholder said star forward Ryan Murphy was welcome to rejoin the team in mid-January, but Murphy ended up leaving the school. Departures: Ramone Snowden, Wesley Myers, Rayvon Harris, James Suber, Julian Richardson, DayJar Dickson, Anders Skou Hansen.